We have over 20 years experience in putting tagging technologies to work in a wide range of businesses. Through our experience, we are able to help our clients select the best in components and to develop straight-forward practical ways of delivering ROI and business benefits from RFID and NFC solutions. 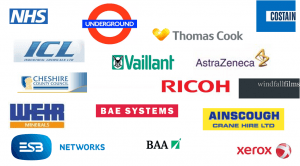 We really enjoy working with a wide range of businesses from a variety of industry sectors such as lifting, asset management, manufacturing, engineering and logistics. If you are an existing customer and would like your project put into a case study, then please don’t hesitate getting in contact and we can discuss this possibility.